We have previously discussed the wholesale attack on free speech principles in France from limits on religious garments to stripping the Internet of anonymity to attempting to criminalize historical accounts. 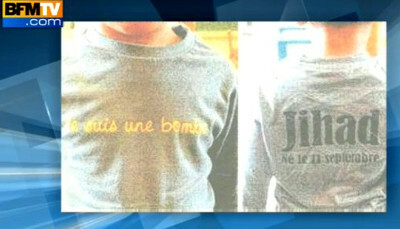 The most recent case involves a woman who named her boy “Jihad” and then dressed her three-year-old in a sweater with the words “Je suis une bombe – I am a bomb” on the front, along with his name and ‘Born on September 11th’ on the back. She was given a suspended jail sentence for “glorifying a crime” — it is a crime that is only punishable if you disregard the most fundamental principles of free speech. It turns out that the boy was born on September 11, 2009. The shirt was actually a present from his uncle Zeyad, 29, who insisted “I had no intention of being provocative or shocking people. For me the words ‘I am a bomb’ mean ‘I am beautiful’”. I fail to see how Zeyad was not trying to be provocative or how “I am a bomb’ could possibly be viewed as meaning ‘I am beautiful.” However, it does not matter. Even if it was meant to be provocative, that is the purpose of much of free speech — to take on controversial or verboten subjects. The t-shirt seems to have a clear political message on the attitudes following 9-11. The mother said that she liked the t-shirt because it had her son’s birthdate on it. A lawyer for the mayor Claude Avril displayed the underlying contempt for free speech by insisting “Idiocy is often the best alibi to hide our real intentions. The most scandalous aspect of this is the manipulation of a three year-year-old to convey the words of terrorism.” Really? I thought the most scandalous aspect of this was a person claiming to be an attorney and actively using the law to punish the exercise of free speech but that might just be me. For better or worse (ie don’t shoot the messenger) the French legal system is very different in many ways with regard to free speech. It is very different with respect th threats, slanders, and speculations about guilt of others. In fact there are laws there, from what I understand, that prohibit certain publications of photography that would give the impression of the person’s guilt prior to such finding by a tribunal. The impression an American might have is that the laws protext the elevated status of the state as well as things that are provocative in nature. The law there seems to value protection at a higher level than the right to speech itself. That is in my lay and very casual understanding of it. in slang language the term }the bomb” means something beautiful, or established..
ex. that song is the bomb! ex, that girl is the bomb. that car is the bomb. this is yet again another attack on free speech. and its an attack on the people. they have to try something to keep the sheep from finally waking up to the truth. and to bad for ” them” the people are slowly but surely waking up to the lies they have been fed their entire lives and since they tried and can NOT censure the internet. the next best thing is to censure the people and attack our rights to speak our minds without the fear of repercussions. word of mouth is what is waking the people up. and true reality is filtering in…… its why their usual flawlessly planned attacks are all over the place now. they are scrambling to find ways to shut out the truth. until their finished product of one world government is in place with no way to undo it..